Another candidate for “best player of all time”, Alexander Alekhine was among the greatest attacking players ever and could seemingly pull combinations out of thin air. With a firey will to win, Alekhine was a fighter who never gave up in any position. He had the highest win percentage of any World Champion as well as the longest average draws as well. His complicated, uncompromising play put his opponents on the defensive and his ability to calculate extremely long variations set him apart from any other players in his time. 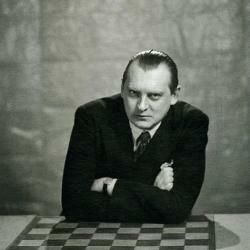 Alexander Alekhine played his first recorded game of chess, a correspondence game, at the age of 10. It wasn’t until five years later that he played his first over-the-board tournament. By the age of 16 he had shown himself to be one of Russia’s top players. In 1914, Alekhine played in a major tournament and placed 3rd behind the two strongest players in the field. Because of this terrific result, Alekhine became a serious challenger for the World Chess Championship in a short time. In 1927, he faced off against Capablanca in the title match and scored a surprising win. He was able to hold onto this title until 1935 when he lost to Max Euwe. He was able to win the rematch though and regained control of the title. At the end of his life, when he was preparing for another title match against the challenger Botvinnik, he died in his hotel room, thus giving up the title. Alekhine passed away on March 24, 1946.